This smaller piece is the first of the new "Boudoir" line, about womanhood and growth. It is part of Ting Yuen's Artist Diary series. This is about loving and accepting yourself. Her dresser is in a corner, because when life's challenges or so-called "mistakes" push us into a corner, we are being offered an opportunity to grow. 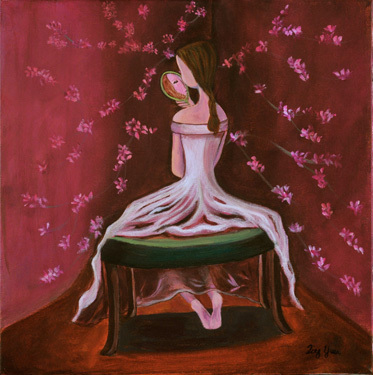 The cherry blossoms represent the beauty of what's inside her. The mirror is a reflection of everything she's done and gone through in her life. Look at yourself and be proud of who you are. You are beautiful!